For the past month, we've been focused on how we can best address our affordability crisis. San Francisco has the highest income gap in the country, and some of the highest housing costs in the world. This isn’t news, but it bears repeating. A record number of high-profile tech companies are expected to hold IPOs (a.k.a, go public) this year, including Uber, Lyft, Airbnb, and Pinterest, among others. Together, these corporations will be worth hundreds of billions of dollars, and thousands of San Franciscans will become overnight millionaires, as billions in new wealth flows into our City. If this sounds familiar, it should. We have already seen new wealth pour into this City, to the benefit of the few. We’ve seen its impacts—not just on our affordability crisis, but on traffic congestion, our transportation infrastructure, our public goods and services, and the health and well-being of the people and communities who call this City home. And in the midst of this, the City enacted policies that exacerbated wealth inequality, and changed our tax system to benefit a few wealthy corporations, while losing tens of millions in revenue that could have paid for raises for teachers, affordable housing, and better public transit. We must better understand the consequences of this extreme inequality, and address it. This has been a focus of our work, as we grapple with some of the largest private companies in our City going public; weigh the best strategies for expanding truly affordable housing; consider how to fund Free City College for the next decade; and determine the City's budget priorities for the coming year. And as always, our work is shaped by your input—so don't hesitate to contact our office with comments, questions, or concerns. 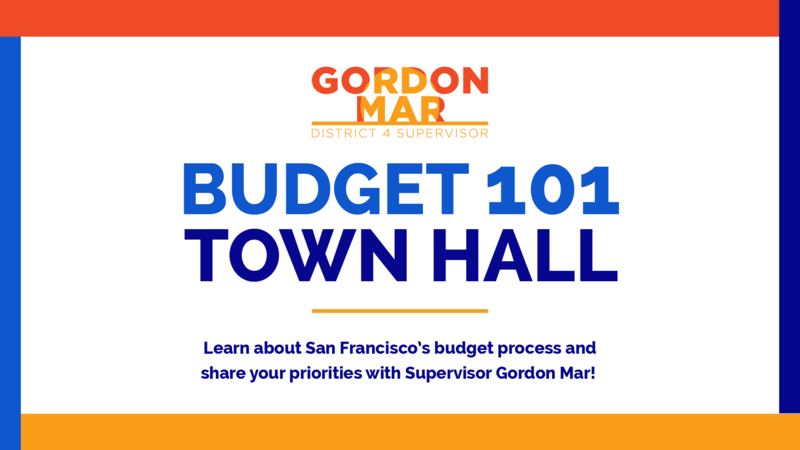 Join us for a Town Hall to learn about how the City's budget process works, and share your perspective on what our funding priorities should be in the year to come. This Town Hall is free, open to the public, and all are welcome! If you can't make it, feel free to email your feedback on funding priorities to marstaff@sfgov.org. A record number of high-profile tech companies are looking to hold IPOs (a.k.a, go public) this year, including Uber, Lyft, Airbnb, Postmates, and Pinterest, among others. Together, these corporations will be worth hundreds of billions of dollars, and thousands of San Franciscans will become overnight millionaires, as billions in new wealth flows into our City. We must better understand the consequences of this extreme inequality and rapid injection of new wealth from these companies going public, and work to address it. This is why I’ve called for a report and hearing on how large IPOs impact housing affordability, traffic congestion, gentrification, and more—and as we grapple with what’s coming, I’m looking at every policy option we have to address it. Former Supervisor Jane Kim placed a Charter amendment on the ballot for this November to guarantee funding for Free City College for the next decade. But voters already approved funding for Free City, and we shouldn't have to vote again to make that commitment a reality. While 2016's Proposition W provided more than enough funds to cover the cost of the Free City College pilot program, the City didn't fully fund it, leaving CCSF to fill the gap. I'm committed to ensuring #FreeCity is fully funded for the next decade with or without a Charter amendment, and pushing the City to fulfill its debt to City College to cover the full cost of the pilot program. I’ve joined Mayor London Breed and Supervisor Vallie Brown to sponsor legislation to waive fees for 100% affordable housing projects and ADUs (a.k.a. accessory dwelling units, or in-laws). I’ve also authored a resolution opposing Senator Scott Wiener’s SB 50—which would override our local control to increase zoning density and building heights across most of San Francisco without increasing requirements for affordable housing or community benefits—unless it’s amended to address the concerns of community members and affordable housing advocates. SB 50 is a giveaway to private interests and developers without listening to, sufficiently protecting, or meeting the needs of our community. We are not simply in a housing crisis—we are in an affordability crisis, and SB 50 is not the answer to truly affordable housing. I wrote an Op-Ed for the Chronicle to share my perspective on why SB 50 isn't the answer we need, and how I think we can more effectively address our housing affordability crisis. Outside money continues to pour into local politics at an alarming rate. Faith in government requires faith in our electoral process, and dark money, pay-to-play donations, and corporate contributions are all dangerous influences on our politics. That's why I put the Sunlight On Dark Money measure on the ballot, which addresses each of these issues with increased transparency, regulation, and public oversight, and why I'm working on campaign finance reform. 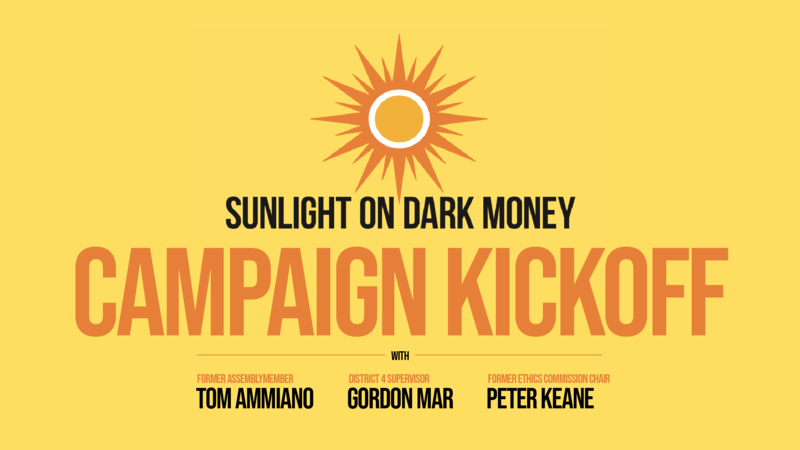 Join us at Manny's as we kickoff the Sunlight on Dark Money campaign to take on dark money in politics, and learn more about the ballot measure! We're holding a hearing on home invasions and package thefts on April 25th. Our office has heard loud and clear that Sunset residents want their homes and packages to be safe and secure, and we have been gathering constituent and victim input in order to devise strategies to secure our homes. Contact my Legislative Aide Alan Wong to participate in the April 25th 10am hearing or share your story of home invasion, burglary, or package theft with our office. We called for a hearing on Muni’s performance and reliability. I’ve heard from constituents every single day about train and bus delays, long wait times, and reliability issues, and you deserve answers. Public transportation can and should be accountable to the public, and I intend to have SFMTA report publicly on Muni’s performance every single quarter going forward. We passed a resolution supporting a permanent memorial for the victims and survivors of the Irish Famine. This resolution will celebrate the history and essential contributions the Irish American community has made to our City, and in particular to the Sunset District, where Irish culture and traditions have rooted and flourished, to the benefit of us all. We joined Supervisor Rafael Mandelman for a rally and resolution declaring a State of Emergency on Climate Change. We need a response proportional to the crisis we face, and the crisis we face is existential. While our federal government denies this reality, it falls upon states and cities to lead, and we must dramatically reduce our emissions in the next 12 years, and quickly work towards an all-electric, sustainable and resilient future. This is just the first step towards a comprehensive action plan to address the climate crisis; we’ll have more to share on this soon. 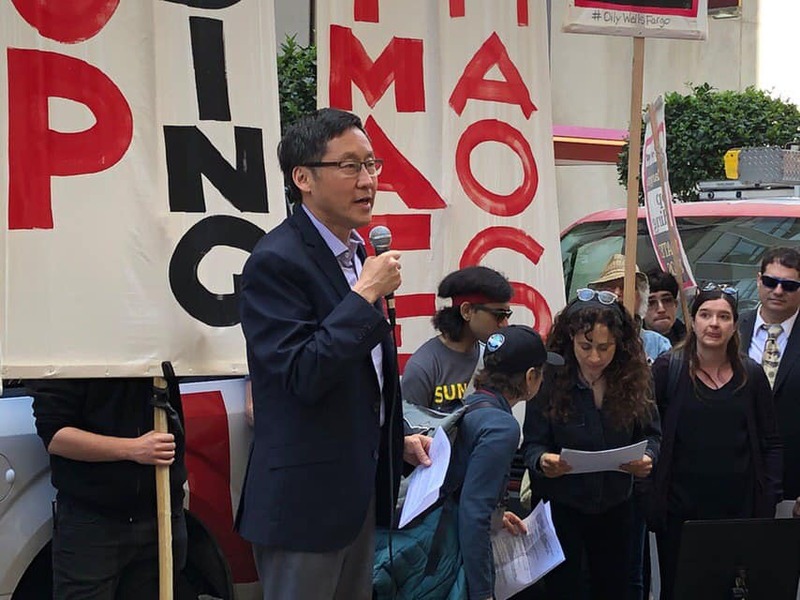 We joined Supervisor Sandra Lee Fewer for a rally and resolution in support of the Medicare for All Act, to say loudly and clearly that the City and County of San Francisco believes healthcare is a human right, not a privilege. We joined the final rally of 350 Bay Area’s March for Fossil Fuel Freedom to call on Wells Fargo to divest from fossil fuels. Wells Fargo calls San Francisco its home. Well, in the City of St. Francis we believe in investing in vulnerable communities, investing in public health, and investing in environmental justice. And until Wells Fargo divests from fossil fuels and private prisons, we the people of this City can divest from them. 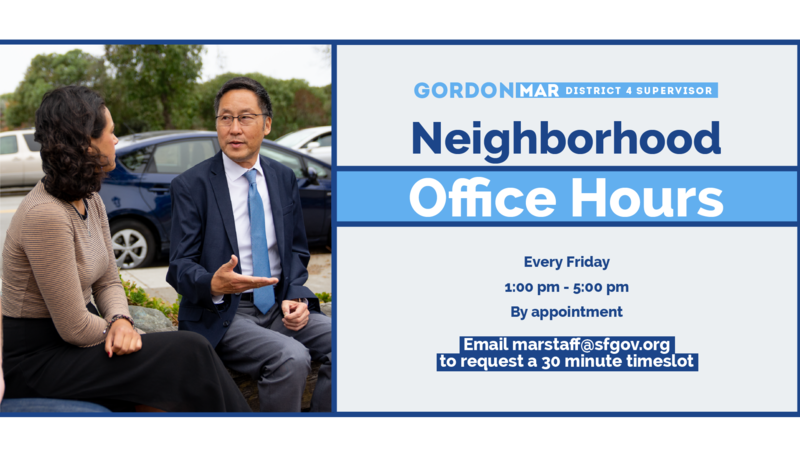 If you'd like to meet with me to discuss your ideas for our neighborhood, email us to book your time slot. The Outer Sunset/Parkside Residents Association will be at the Ortega Branch Library on Wednesday, April 3rd. I will provide an update on the district, recent proposed legislation and upcoming town hall on the budget. The other speakers will be John Scarpulla from the SFPUC and Fire Chief Rivera who will speak about the City's AWSS system and how it impacts disaster preparedness in the Sunset District with regards to fire prevention. Email ospra.org@gmail.com with issues, subjects, and ideas you would like covered in this or future meetings. 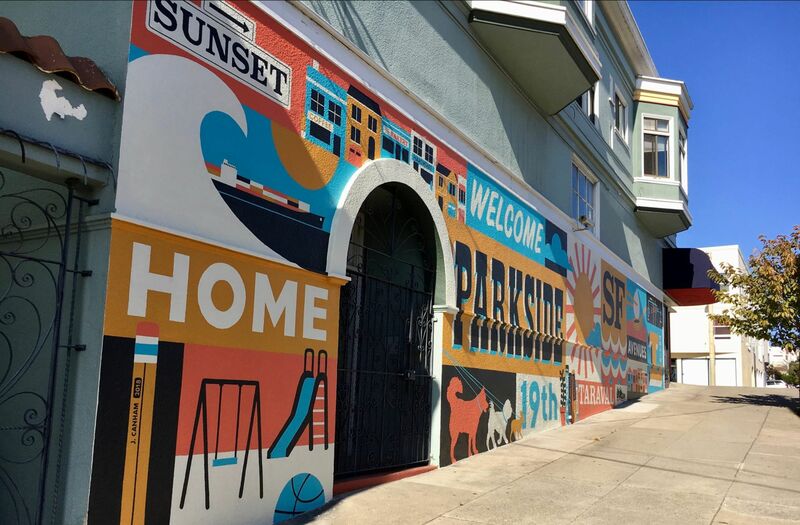 Join Parkside merchants and neighbors for their April meeting, featuring an update from SFMTA on the L-Taraval project. Thursday, April 4th, at 7pm at the Taraval Police Station, 2345 24th Ave, San Francisco, CA 94116. 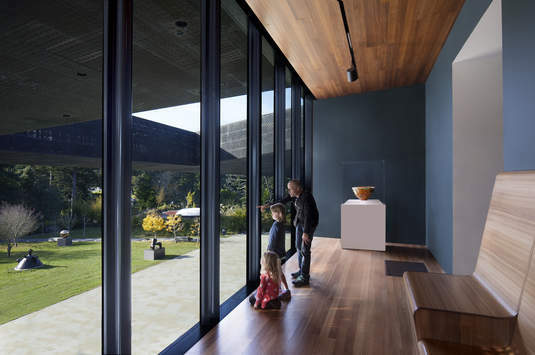 Introducing free days at the de Young and Legion of Honor! This April, the Fine Arts Museums of San Francisco will roll out multiple new programs to provide free and reduced admission to their permanent collection galleries and special exhibitions. For San Francisco residents, general admission to the de Young and Legion of Honor will be free every Saturday starting April 6. 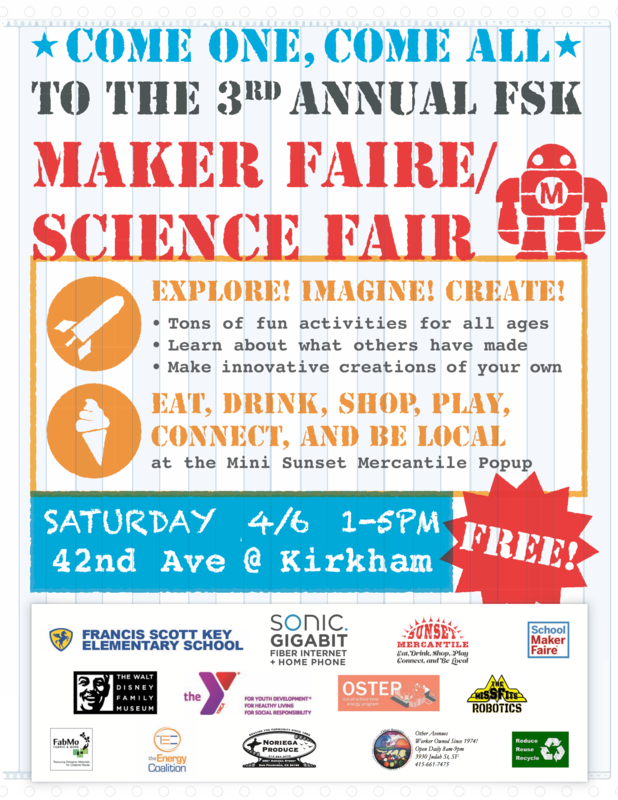 Join us Saturday April 6, 2019 from 1-5 pm for FSK’s 4th Annual Community Mini-Maker Faire. FREE ADMISSION. We will be creating, sewing, building, flying, chalking, shrinking, launching, coding and rocking! Come, create, innovate! 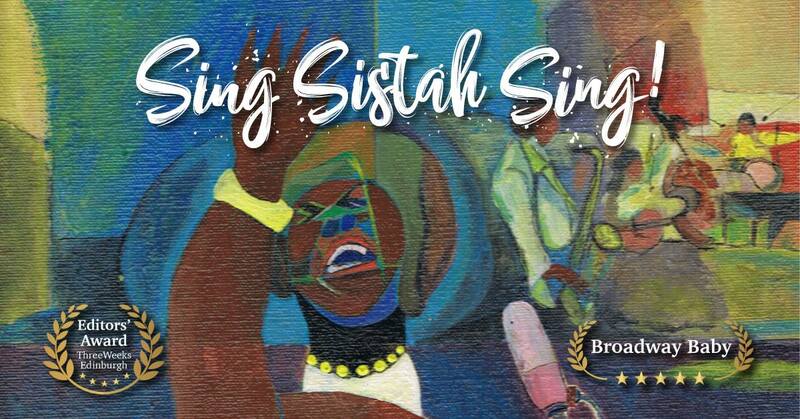 Sunset Music and Arts Presents Andrea Baker’s Sing Sistah Sing! Andrea began her operatic career with the San Francisco Opera, and now resides in Scotland. The show is both a celebration of the sound and extraordinary breadth of the African American female voice, and a heartfelt retelling of some of their most incredible life stories. Playland is a collaborative, all-inclusive, multi-use Sunset community park project on 43rd near Judah. A place to play, connect, create and just be. Pups and the Planet - Animal and Eco-Friendly tips to help your pup, the planet and all animals! Small changes that can make a big difference. Attendees receive a free eco-friendly poop bag roll! Spring training - solutions for potty training, chewing, barking, and more! Bring your questions and join us! Bike & Roll to School Week is April 15-19. Sign Up Now! 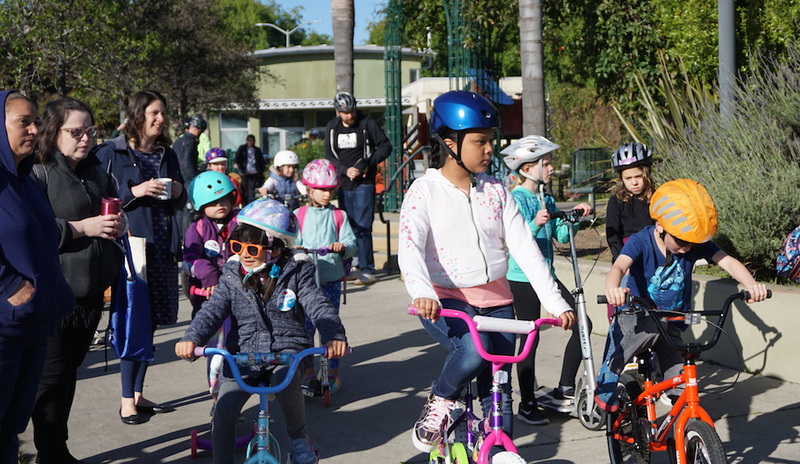 Join the fun when schools across San Francisco celebrate the annual Bike & Roll to School Week April 15-19. Thousands of students, parents and teachers will ride in “bike trains” or otherwise roll to school. Sign up your school for best day of the week. Encourage everyone to roll by bike, scooter, wheelchair, or skateboard. There’s a chance to win a free bicycle, too! Is your school registered yet? Learn more. Poems Under the Dome invites you to celebrate National Poetry Month on April 18, 2019! 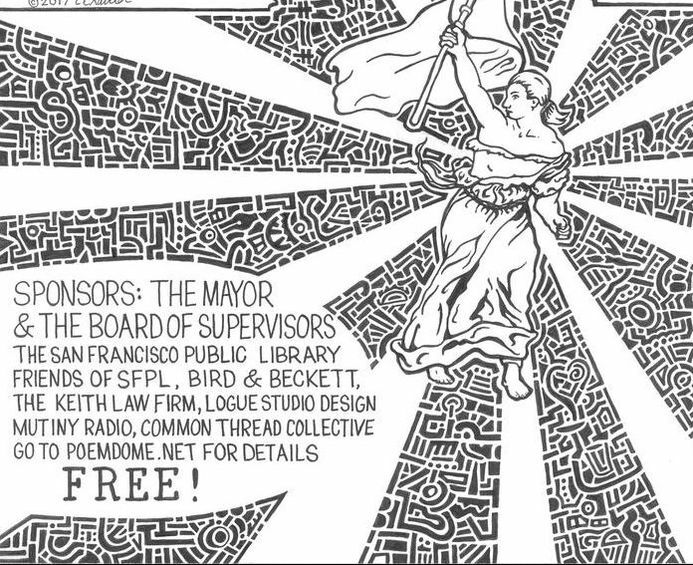 Read your favorite poem or perform one of your own at San Francisco’s largest open mic poetry event inside City Hall. This FREE all-ages event runs from 5:30 to 8:00 p.m. in the North Light Court. Visit their website for details. This opportunity to read poetry in such a unique setting always proves to be popular, and on the day of the reading each of the performance slots will be apportioned by drawing names from our magical hat, and limited to one poem for each reader. Please visit their website for complete participation details. Please join us for the annual Sunset Open House celebration at Sunset Branch library! There will be live jazz, a food demo & tasting, bike-powered smoothies, snacks, button making, book giveaways, community groups including the Western Neighborhoods Project & Community Living Campaign/Always Active, and an appearance by circus performer Bri Crabtree and her Silly Circus Show! Come join us for all the fun and enter a raffle to win prizes from local businesses! Concerned About Airplane Noise in the Sunset? · The SFO Roundtable: A voluntary committee of elected officials to address noise impacts from aircraft operations at SFO. They host regular meetings and the community is encouraged to attend. Learn more here. · File a noise complaint: You can voice your concerns by filing a complaint with SFO. These complaints are logged by the airport and are how the impact of noise disturbances are tracked. Starting in April, residential electricity customers in San Francisco will be enrolled in CleanPowerSF, a community choice clean energy program operated by the San Francisco Public Utilities Commission (SFPUC). Currently, the energy you receive from PG&E is about 33% renewable. When you are enrolled as a CleanPowerSF Green customer, your home will be powered with at least 40% renewable energy at rates that are competitive with PG&E’s. You’ll also have the option of opting up to 100% renewable energy for just a few dollars more per month, or opting out of the program and staying with PG&E’s service. The SFPUC has been providing San Francisco with 100% greenhouse gas-free hydroelectric energy for the past 100 years from the Hetch Hetchy Power System. This clean power energizes SF street lights, Muni, schools, City Hall, SFO, the zoo and other civic institutions and facilities. CleanPowerSF is run by the same clean energy experts. The SFPUC also delivers your great-tasting Hetch Hetchy Tap Water and operates the San Francisco Combined Sewer System. 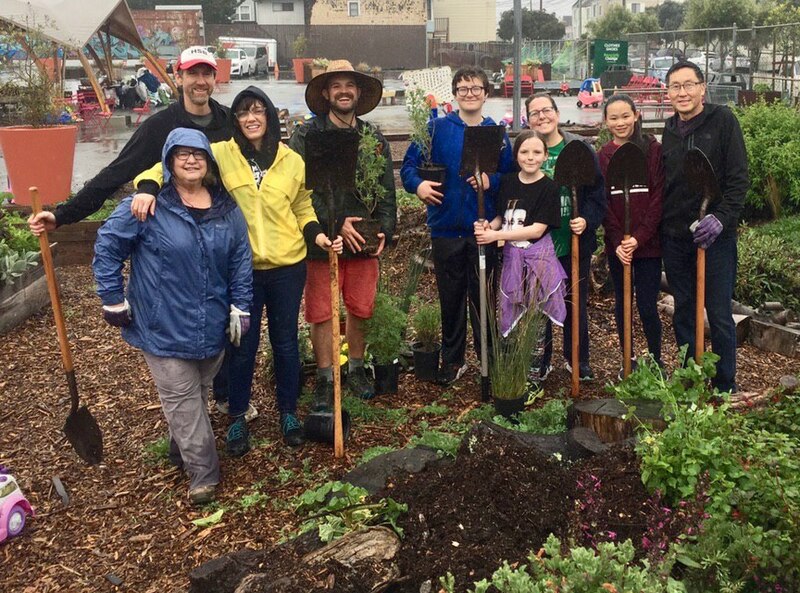 CleanPowerSF is building on that tradition of community-based service and intends to reinvest ratepayer funds into the development of new clean energy infrastructure, which will create jobs, localize our energy sources and keep electric rates stable. For more details about CleanPowerSF, visit www.cleanpowersf.org. 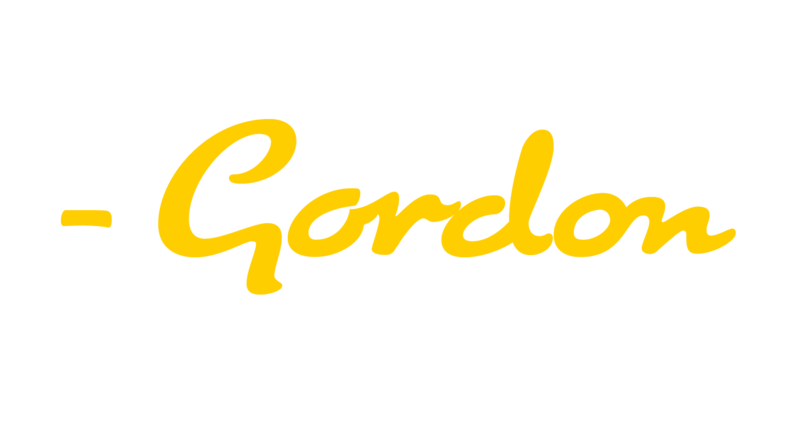 Have an event you'd like us to include on a future newsletter? Let us know!